We are thrilled to welcome Meredith Spradley of Fabulous Fancy Pants to the Calligrafile team! Meredith is a calligrapher whose desire to find the perfect handmade paper for pen and ink led her to start making her own. She created a recipe for cotton rag paper, treated in such a way that ink and watercolor won't bleed, and even pointed nibs can skim the surface. Meredith's side business quickly grew into a full-time job and Fabulous Fancy Pants was born. Due to its unique surface quality, Meredith's handmade recipe has now become one of the calligraphy community's preferred cotton rag papers. In honor of Meredith's joining our team, we are offering up a fabulous giveaway in conjunction with Fabulous Fancy Pants and UPPERCASE magazine. Meredith will be giving away one pound of cotton rag paper to four lucky winners! Read our interview with Meredith below, where she tells us about her background, her journey to becoming a creative freelancer, and the story behind her company's fun name. My home and studio are located in Rock Hill, South Carolina (USA). Please tell us a little bit about the birth of your company, Fabulous Fancy Pants, and what drove you to enter the paper making business? Fabulous Fancy Pants was initially my hand lettering business, named for what my third graders and I called “fancy pants writing”, which was their daily cursive instruction. The paper making developed out of necessity as I was having a hard time finding handmade papers that my lettering clients were increasingly requesting, and many that I tried were not ink friendly. So I set about trying to figure out how to make paper that was consistent in weight, could be printed on with a desktop inkjet printer, and would not be a nightmare for a calligrapher. While I had some experience with recycled paper making, I knew I wanted to make paper from cotton due to my native Southern region's rich cotton textile heritage. With a steep learning curve, it took almost a year for me to develop what I now call my “recipe” for cotton rag paper. Many calligraphers think of handmade papers as being difficult to work with, due to their texture and tendency toward bleeding ink. What makes your paper different from other cotton papers on the market? There was a time during my early years as a calligrapher that I avoided handmade papers as much as possible. With experience, I found that if I treated the paper with a fixative that I could control the bleed somewhat. I knew that I wanted to make paper that already was treated, or “sized” with organic alum and rosin, not animal by-products such as gelatins. This sizing has resulted in a paper with a more nib-friendly texture without losing the beautiful tooth of the paper’s surface. Inks, gouache, watercolors, and other mediums work well with this paper. I love to see and share what my fellow “ink artisans” create using the blank palette of my cotton rag papers. I encourage anyone who is intimated by the paper to order discounted blemished paper to experiment with. And what about calligraphy? What sparked your interest in that, and what path have you taken to master the art form since that time (formal training, independent study, a combination of the two)? I can’t remember a time when I wasn’t lettering, I just didn’t know to call my doodles and scribbles that! I took several local calligraphy workshops and owned just about every form of ink cartridge calligraphy kit sold back in the 1970s but never could get the hang of the broad edge letterform. In the 1990s I took a workshop at Historic Williamsburg, learning to write Roundhand with goose quills and steel nibs. Fast forward to 2009 when I was diagnosed with breast cancer and spent a year in treatment, I found myself with a lot of time on my hands to pick back up my lettering with more easily acquired nibs, pens, and inks thanks to the Internet. Even though my lettering business was immediately successful, I never felt “legitimate” because I was self-taught primarily, and I wasn’t using traditional letterforms. Molly Suber Thorpe’s book on Modern Calligraphy was a major paradigm shift for me in reinforcing that modern calligraphy is indeed a legitimate art form. Changing careers can be scary! What advice can you offer people considering a transition from steady employment into a creative freelance career? In my previous professional career in education, I had 27 years of experience, a PhD, and no plan to change careers. But being diagnosed with cancer at the age of 44 changed all of that abruptly. Fortunately, my husband is a CPA and helped me to create a business plan. My advice to anyone considering this transition would be to partner with a business planner or accountant to create a transition plan with a very flexible timeline. Many times this may mean that you are working two full time jobs until the income is steady and somewhat predictable. I am fairly accomplished in the art of hand embroidery and French Hand Sewing. I can trace my love for vintage and contemporary textiles and handwork to my childhood. I can still smell the cedar of my grandmother’s linen chest in Savannah. Inside were cottons and laces lovingly starched, pressed, and waiting to be used. She took the time to teach me the basic embroidery stitches that I still practice today. 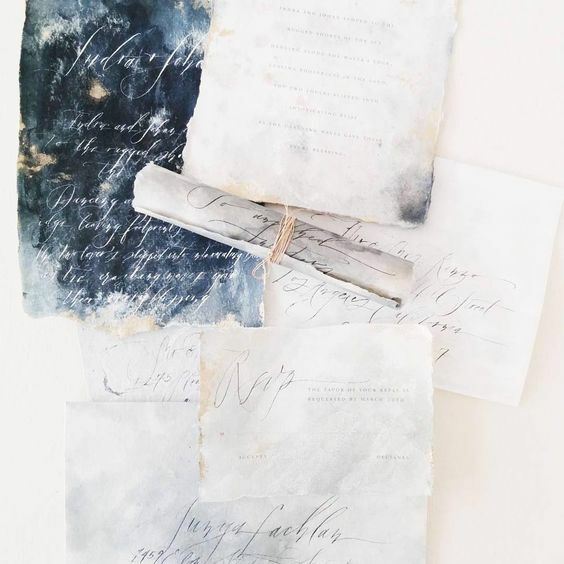 As a calligrapher who works with a lot of inks, watercolors, and stains, Meredith Spradley strives to provide customers with beautiful paper that is also sized to prevent feathering and bleeding. This paper has a wonderful feel and tooth to it, and many sizes are offered in a variety of thicknesses (150gsm, 250 gsm, and 300gsm). All thicknesses are perfect for letterpress as well as appropriate for almost any use, including pen and ink, drawing, colored or graphite pencils or light washes of watercolors. It will also work for mixed media.